on November 29, 2018, 1:09 p.m. In 2014 Souq.com brought Black Friday to the UAE, renaming it White Friday in respect to Friday being the day of worship in the Arab world. The American sales phenomenon which is held the day after Thanksgiving has grown in popularity in the UAE, with this year seeing offers extended for a ‘deals week’ as opposed to the original one day event. UAE e-tailers Souq.com and noon.com both took part this year, annoucing deals of up to 70 per cent off on selected products for a five day period from 20th to 24th November. Both brands heavily advertised the promotions in the lead up to the sales period, with noon.com naming their event Yellow Friday. YouGov BrandIndex data shows the impact of both Souq.com and noon.com’s Black Friday campaigns. Focusing on scores from the aware only population (ie excluding respondents from the base size, who are not aware of Souq.com or noon.com) and using the 24th October as a baseline from which the uplift in score is then plotted, we can compare whose advert better reached their audience and increased awareness of their sales over this period. 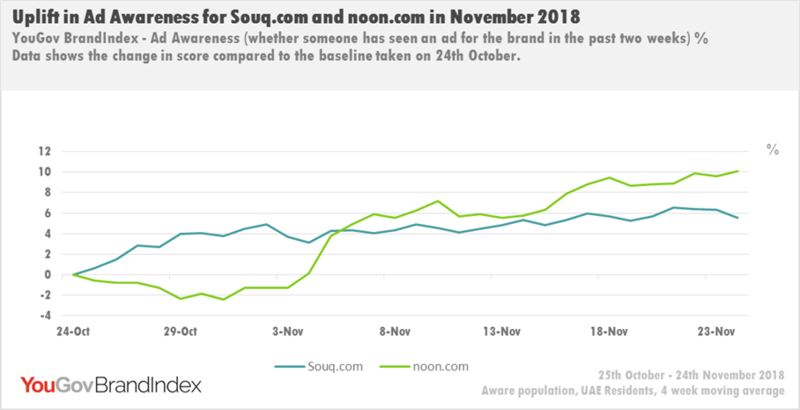 Souq.com and noon.com can be pleased to know their advertising efforts were a success, with both brands’ Ad Awareness scores (whether someone has seen an ad for the brand in the past two weeks) increasing throughout November. Souq.com saw an initial uplift in their Ad Awareness at the beginning of November, increasing by 4 points by the 2nd November compared to the score recorded on the 24th October. The increase then remained flat for just over a week, before rising again, peaking at a 6.5 points above baseline on the 21st November. On the other hand, noon.com’s uplift in Ad Awareness began on the 4th November, rising impressively by 7.2 points through 10th November, then peaking 10 points above baseline on 24th November, compared to scores recorded a month earlier. As well as White/Yellow Friday promotions, both Souq.com and noon.com ran 11/11 discounts, with noon.com registering clearly identifiable uplifts in their Ad Awareness score around that time period. Similarly, both e-tailer’s Buzz scores (which measure whether someone has heard something positive or negative about the brand in the past two weeks) saw uplifts throughout November. Souq.com saw a greater positive change in Buzz score around the 11/11 promotion, increasing by 2.9 points through 12th November (compared to 24th October), while noon.com saw a smaller 1.1 point increase in this period. The opposite was true for Buzz scores around the White/Yellow Friday week, with noon.com leading Souq.com on uplift in Buzz from 17th November onwards (with the exception of the 21st where the uplift was almost equal). noon.com finished their Yellow Friday promotion period with their Buzz score an impressive 8.6 points higher than that recorded a month earlier, while Souq.com saw a somewhat smaller uplift of 4.8 points. Both e-tailers can be confident their White/Yellow Friday campaigns were noticed by UAE residents who were already aware of their brand. After these successful campaigns both Souq.com and noon.com will be hoping they can continue this momentum into the year-end festive period, and YouGov BrandIndex data will continue to show the impact of focused campaigns during the holidays, as well as resulting shifts in perception amongst UAE residents.